We also have a number of upcoming conference events : click here! Author, lecturer, and energy Investor Ramez Naam will be on campus to talk about “The Exponential Energy Revolution: How Clean Energy is Disrupting the $6 Trillion Energy Industry” as part of a wider Earth Day event at UW-Stevens Point. Austin Channing Brown is a leading new voice on racial justice, and author of I’m Still Here: Black Dignity in a World Made for Whiteness. Austin is committed to exploring the intersections of racial justice, faith, and black womanhood. Most recently she served as a Resident Director and Multicultural Liaison at Calvin College. Wisconsin Women in Government has announced its 2019 Scholarship and Recognition Gala, to be held at the Monona Terrace Community & Convention Center on Lake Monona. WWIG is proud to present this year’s gala in partnership with the Tommy G. Thompson Center on Public Leadership and the Wisconsin Historical Society, as we celebrate the 100th anniversary of Wisconsin’s ratification of the 19th Amendment. The keynote speaker for this event will be Kristen Soltis Anderson; a pollster and co-founder of Echelon Insights, a research and analytics firm. She was one of TIME‘s “30 Under 30 Changing the World” and has been featured as one of ELLE‘s 2016 “Most Compelling Women in Washington.” Anderson is also an ABC News political contributor, columnist at The Washington Examiner, and is the co-host of The Pollsters, a bipartisan weekly podcast. She regularly appears on programs such as Morning Joe, Fox News Sunday, Real Time With Bill Maher and more. Free Tickets to the event can be found here! Dr. Arthur Brooks is the President of the American Enterprise Institute (AEI) and also a columnist for the Washington Post, a host of the podcast “The Arthur Brooks Show,” and the bestselling author of 11 books on topics including the role of government, fairness, economic opportunity, happiness, and the morality of free enterprise. Dr. Brooks will be joining us to discuss his latest book, “Love Your Enemies – How Decent People can Save America from the Culture of Contempt” which is sure to be of great interest to all in attendance. Tickets are not yet available for this event. The Tommy G. Thompson Center was very pleased to host former Attorney General Alberto Gonzales and Attorney Dean Strang to speak about criminal justice reform at UW-Madison’s H.F. DeLuca Forum in the Discovery Building. April 15, 2019; 4:00 P.M. The UW Institute for Research on Poverty will host Michael Tanner, a Senior Fellow at the CATO Institute on April 15. The event will feature a discussion of the topics of his newest book, which examines poverty in America and critiques the political Right and Left on what they get wrong in addressing the issue. A reception will be held after the event. This event is also sponsored by the Center for Research on the Wisconsin Economy and by the Thompson Center. Frederick Hess is Resident Scholar and Director of Education Policy Studies at the American Enterprise Institute. He spoke on the key lessons he’s learned about education reform over 20 years, illustrated by his experiences talking to politicians, philanthropists, and school leaders around the world. 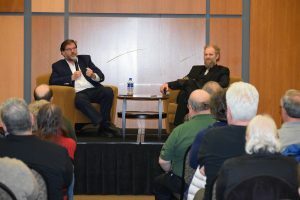 Author and political commentator Jonah Goldberg (Left) was at the UW-Parkside to talk about his new book, “Suicide of the West: How the Rebirth of Tribalism, Populism, Nationalism, and Identity Politics Is Destroying American Democracy.” This free Q&A session was moderated by UW-Parkside Political Science and Law Professor Dr. Ross Astoria (Right). John McCormack a Washington D.C. correspondent at the “National Review” kicked off a new UW-La Crosse lecture series that aims to bring some civility back into political discussion. 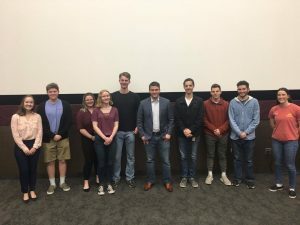 John will spoke on “A Crisis of Civility: How the left and the right are damaging political debate in America” at an engaging event attended by around 70 students, faculty, and members of the public. John McCormack has appeared on a variety of radio and TV news programs, including MSNBC’s Morning Joe, CNN’s Inside Politics, HBO’s Real Time, NPR’s On Point, and several Fox News shows, including Special Report with Bret Baier. 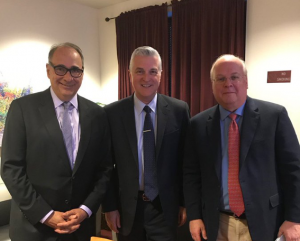 National political strategists and former senior advisors to Presidents Barack Obama and George W. Bush, David Axelrod and Karl Rove, were on the UW-Green Bay campus for a Point-Counterpoint Conversation on Wednesday, April 3. Over 700 students, faculty, and members of the Green-Bay community and beyond registered to attend this event. The event consisted of an hour of Q.A. with UW-Green Bay students and was followed by a larger free public event designed to provide and promote civil, non-partisan and thought provoking conversation about election polling and strategy, politicians and presidents, red and blue culture, the state of our democracy, the media and more. Fox News 11 and ABC 2 news both aired stories on this event. 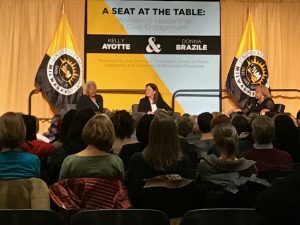 Donna Brazile, an American political analyst, and Kelly Ayotte, a former U.S. senator, spoke at the UWM Union Wisconsin Room on Monday, April 1, 2019. They lead a conversation spanning across political parties with a focus on women in leadership and politics. Over 150 students, faculty, and members of the public attended this excellent event. The Thompson Center would like to thank the University of Milwaukee for their substantial assistance in putting this together. The Tommy G. Thompson Center was thrilled have Michael Murphy deliver a talk regarding the state of contemporary politics in America. The conversation spanned presidencies, elections, the future of the democratic and republican parties, the rise of the “I’m right, you’re evil” mentality prevalent in current political discourse. Conservative pundit and former WTMJ-AM radio host Charlie Sykes discussed his book How the Right Lost its Mind and engaged in an extensive question-and-answer session at a forum about overcoming partisan politics for the public good. Sykes is an NBC and MSNBC contributor, a contributing editor at the Weekly Standard and the host of the magazine’s Daily Standard podcast. He is also author of nine books and was co-editor of the National Review College Guide. In an effort to foster civic engagement in Wisconsin youth, the Wisconsin Newspaper Association Foundation launched the Wisconsin Civics Games, which took place during the second semester of the 2018-19 school year and were open to all Wisconsin high schools. The Thompson Center sponsored the regional Wisconsin Civics Games at UW-Madison’s Union South. Center staff in attendance felt they were a smashing success, and were greatly impressed by the calibre of student participants who took part in the competition. Governor Thompson and his biographer Doug Moe were in Madison to talk about their new book, and to hold a question and answer session with the audience. The Governor engaged the audience with stories from his childhood, from his early days running for office, and of some of his experiences as both Wisconsin’s Governor and Health and Human Services Secretary. Following this was a reception and book signing. The Tommy G. Thompson Center sponsored debate and election night viewing events at UW-System campuses around Wisconsin! 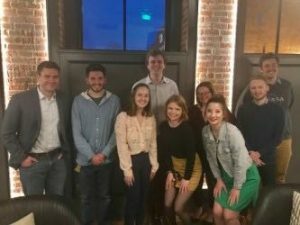 These events bring together UW students from across the political spectrum to view the American political process in action. The Tommy G. Thompson Center was pleased to partner with the Committee for a Responsible Federal Budget (CRFB) to put on an exciting, fun, and free public event at UW-Madison’s Education Building! Attendees were asked to solve the federal debt crises. Judge Jeffrey Sutton was on the UW-Madison campus and delivered a talk to students and other attendees on September 25th. The Thompson Book Event celebrated Governor Thompson’s legacy of pragmatic policymaking, interest in tackling big issues, and willingness to work across the aisle. Governor Thompson discussed his new book TOMMY: My Journey of a Lifetime and weighed in on contemporary policy matters. The event was largely sponsored by the Thompson Center, working in conjunction with WisPolitics.com. The Center hosted Dr. George Koonce in May of 2018. Koonce is a former linebacker for the Green Bay Packers and shared with us his own story of challenges and finding the strength to overcome them. Cosponsored with the Center for the Study of Liberal Democracy at UW-Madison. Professor Keith Whittington of Princeton University headline presented, with discussion from Professors Donald Downs, Howard Schweber, and Anuj Desai. Cosponsored event which provided information to principals on what the First Amendment allows in the public school setting as well as how the First Amendment will apply to students who go on to colleges and universities. The Center worked with the La Follette School to have Professor Jennifer Doleac present her research while in Madison for the Center’s criminal justice conference. She came to Madison a day early to teach La Follette’s students about her discoveries. Cosponsored along with the Department of Economics and the Center for Research on the Wisconsin Economy, on the particulars and potential outcomes of school choice. Caroline Hoxby of Stanford University headlined, and the discussion drew in students and faculty across the university.